An update: The airport is still closed. The anti-government protesters attacked a police checkpoint and confiscated ten vehicles and the riot gear inside. But, in a telling twist, the protest leaders also had a face-to-face meeting with the police, asking for their increased protection. This after a bomb was thrown at their protest at Government House, injuring fifty people, four seriously. 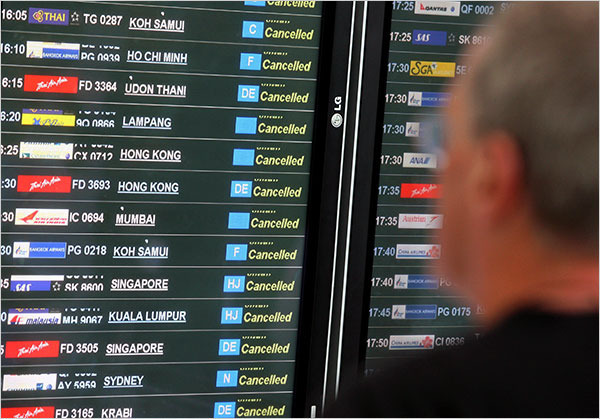 Airports of Thailand, the semi-public company that runs Suvarnabhumi and Don Meuang airports, reached an agreement with the protesters to allow pilots from the various airlines to ferry the 88 airplanes that are stranded at the airports, out of the country. The protest leaders agreed to this because they didn’t want to be responsible for any vandalism that might happen to the planes. Pro-government protesters gathered in front of Bangkok City Hall and they promise to take back the airport if the police can not or will not. There are calls for exposure of who is actually supporting the anti-government protesters, suggestions that they must be supported by very influential members of Thailand’s elite if they are allowed to act with impunity for so long. Much seems to hinge on Tuesday’s Constitutional Court verdict in a case about voter fraud. Three parties, including the government majority party, the PPP, are facing dissolution. This might pacify the anti-government protesters who might then clear the airports. But the pro-government faction sees a potential “coup by court” and is already saying they will fight any miscarriage of justice. Can it continue? Many observers say it will have to come to an end by Friday, December 5th – His Majesty the King’s 81st birthday. But who knows what will really happen? But that’s just the headlines. The real story is what’s happening with the tens of millions of Thais who are not protesting. A poll published this morning shows that 92% of Thais surveyed think both sides should put their differences aside for the good of the country. 76% see it as “a national shame”. A few days ago, Ajarn Yai, the former director of the school where I volunteered as an English teacher, called Tawn. She wanted to convey her apologies to me on behalf of the Thai people, but was too embarrassed to call me directly. 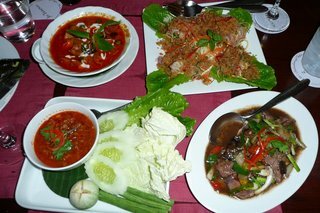 She said that if I had any guests in town, I should bring them down to Samut Songkhram province and she would entertain them. Ajarn Yai (“Ajarn Yai” means “big teacher” in Thai) asked whether Trish was still in town. She was relieved to hear that Trish had made it out in time and said that if Trish was still in town, she would have offered to have Trish stay with her for a few days, to take the burden off of me. That’s sweet, isn’t it? And very telling. Here’s the top-of-the-fold story in this morning’s The Nation, one of the two English-language papers here in Bangkok. They say a picture says a thousand words and in this case, it is probably more like a full novel about Thai culture. 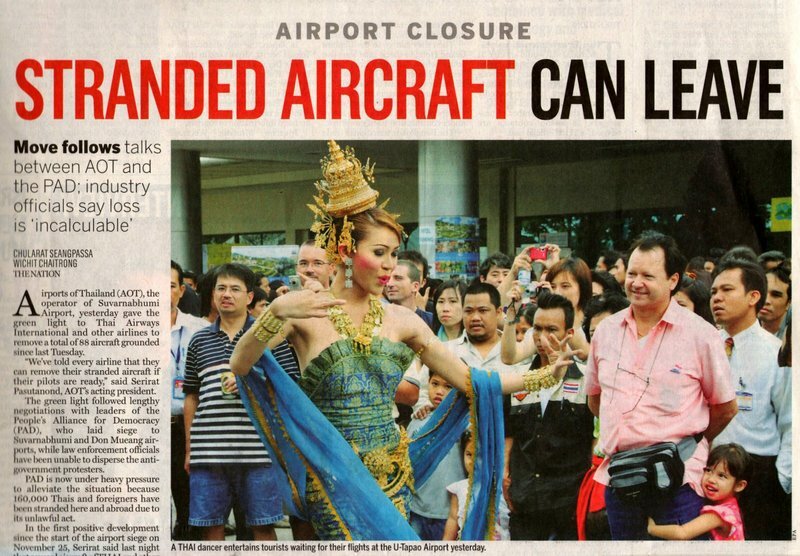 What you see is a traditional Thai dancer (Tawn is pretty sure she’s a he, though) entertaining crowds at U-Tapao Airport. U-Tapao is a miltary base about 190 km (two hours’ drive) southeast of Bangkok, built by the Americans during the Vietnam War. It is being used for some flights to get stranded foreigners out of the country, but it has no commercial facilities and can only handle about 40 flights a day compared with Suvarnabhumi’s 700. They’ve had to bring in porta-potties so the crowds can relive themselves. Passengers are checking in at one of the hotels in town, the Centara Grand, and are being bussed to their flights. They have to check in at least five hours before their flight. THAI Airways, as you can see, is making an effort to make the experience a little less painful, by providing some entertainment for the crowds. A story in The Nation also told about how THAI employees are pitching in to help with the chaos at the hotel check-in area, with flight attendants comforting passengers and employees’ mothers making food for the ticketing agents, who can barely leave their posts. Tawn had to laugh when he saw the picture in the papger. “That’s very Thai,” he said. And it is true. It says so much about Thai culture. First, to their credit, the Thais are very gracious hosts. 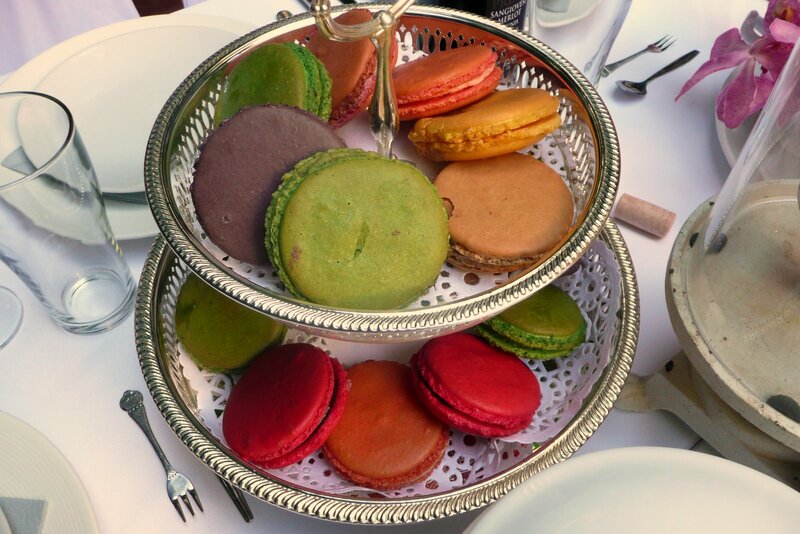 They try to make every experience pleasant and so by trying to entertain their guests and show some beauty, they are making the best out of an improbably difficult situation. The flip side to that, the one that can make non-Thais jai rone (hot headed), is the sense that in a completely out-of-control situation, effort is being expended on some window dressing rather than actual solutions. I’m an optimist, though, so I see things through the first point-of-view. That said, Boon and David had to fight a chaotic crowd to get out on a flight at U-Tapao yesterday, Markus had to take a 10-hour van ride to Phuket to catch a special Lufthansa charter to Frankfurt, Anthony and Francis are still uncertain if they’ll be able to leave this evening on their re-scheduled flight, Brian is still stuck in Hong Kong and Ken is stuck in Chicago, both unable to return, and I personally know of at least eight people who have cancelled trips here. Tawn and I agreed that if the airport is still shut down on December 18th when we are scheduled to fly to the US, that we’ll change out ticket to one-way out of the country. 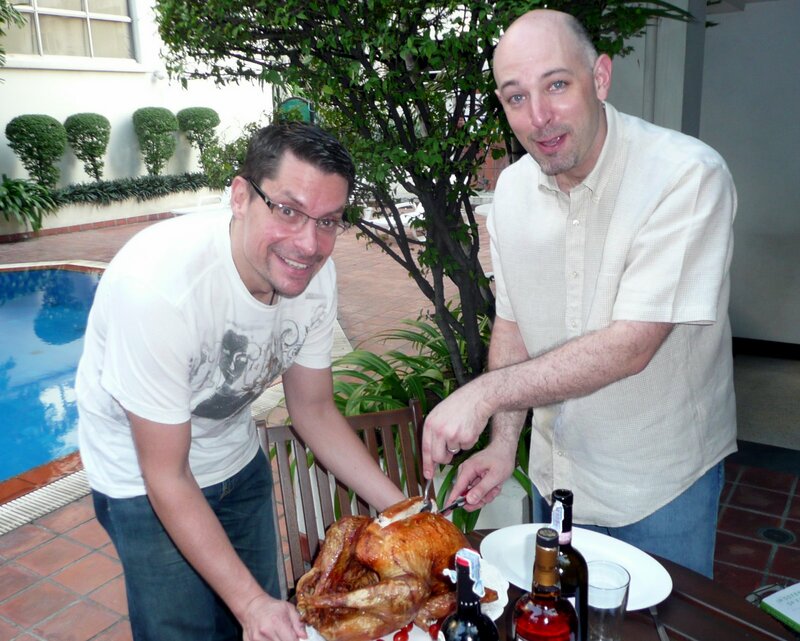 Thanksgiving has come and gone and it was, by most measures, the most successful party we’ve hosted here in Thailand. 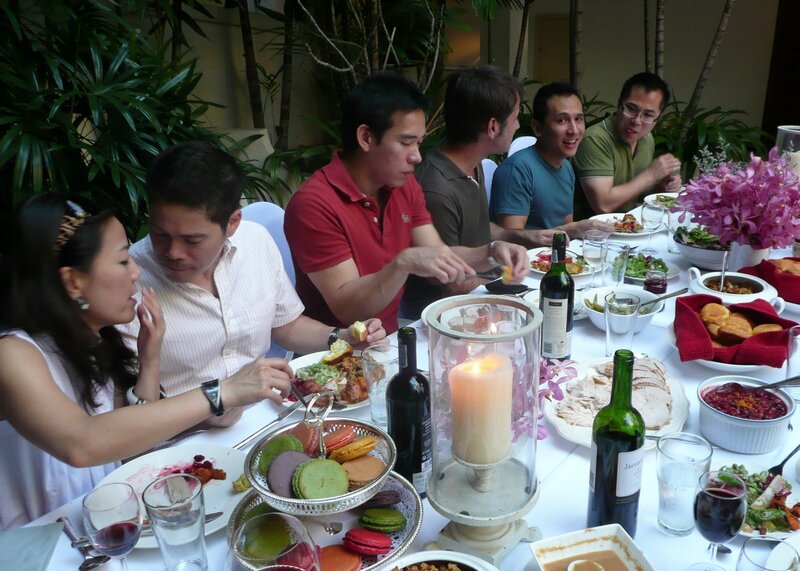 The last minutes weren’t a frenzied rush to the table, clean-up wasn’t such a hassle, and the food was very good. I started Friday about 6 pm and prepped until just after midnight, focusing mostly on the stuffing and getting dry ingredients measured out for Saturday’s baking. All about that in the previous entry. Saturday I started about 8 am and worked through my list one item at a time. 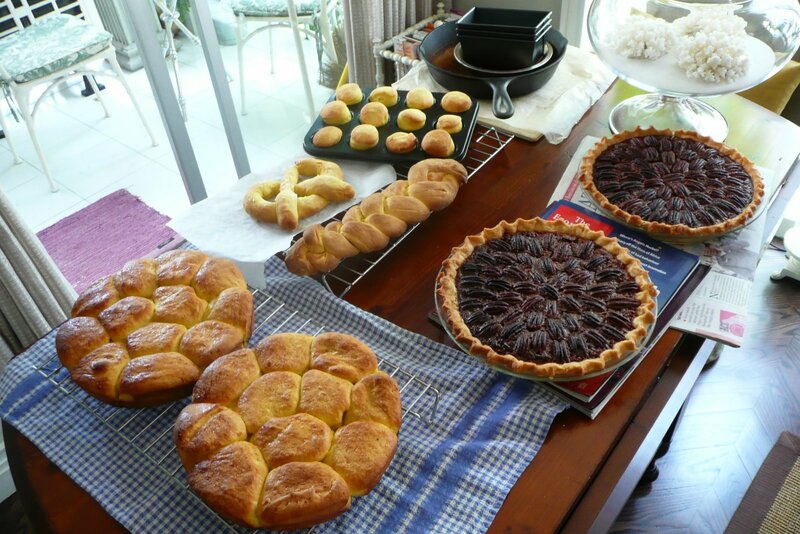 The morning was spent baking pecan pies and squash rolls. After making four dozen rolls I still had dough left over, so I played with it, making a braid, some mini rolls in a muffin tine, and a pretzel. This time around, I tried brushing the rolls with a milk and egg wash. Ultimately, I think they are butter wish just some butter on top. Also, I think I overbaked them a little. They were not as light as the test batch I did earlier in the week. The pecan pies were gorgeous and not too sweet. I love the recipe. Our guest list continued to fluctuate. Ultimately, of the original guest list, we lost four because of the airport closure, gained two because of some new friends that entered the group, and then lost three at the last minute because of various complications. Trying to plan for an ever-changing number of guests is a pain. I ended up making a lot of extra food, which I realize is the case for Thanksgiving, but I’m not sure how much stuffing I really need. 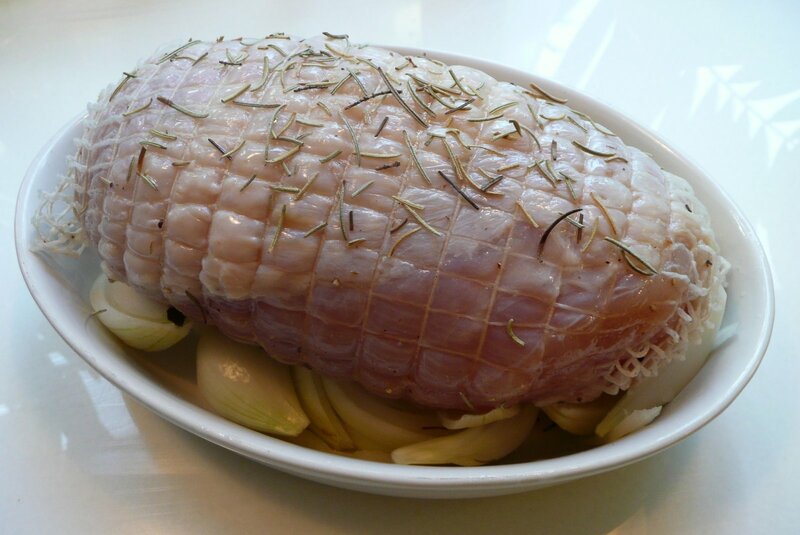 Fearing that the 16-lbs turkey would not be sufficient (remember, it looked like we were going to be up to 20 guests at one point), I bought an additional turkey breast, dry brined it and roasted it Saturday morning. Despite dry brining it only about 30 hours, it turned out very salty throughout. Not sure whether I used the wrong type of salt or more than I should have but, while not inedible, it left me drinking a lot of water. 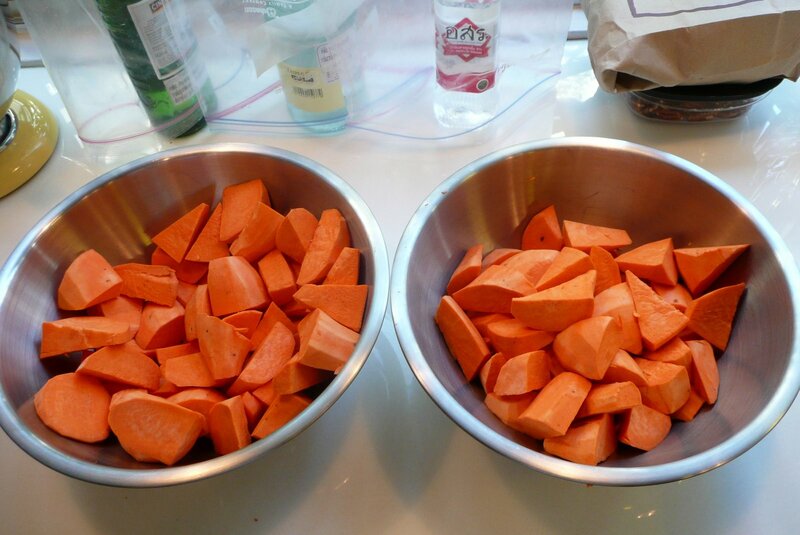 For the sweet potatoes, I went with the toasted spice rub. They turned out well, again I had way too many prepared, but I think they were a little over-cooked and mushy. Setting up tables and chairs downstairs by the pool. 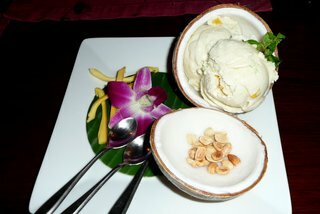 The weather was perfect – about 80 degrees and a light breeze – and having a company provide all the dishes, etc. (and taking them away afterwards to be cleaned) made all the difference in the world. Having people outside the house kept the gathering from feeling crowded. Our house is really at its best with six guests, no more. Having some friends come over early to help. 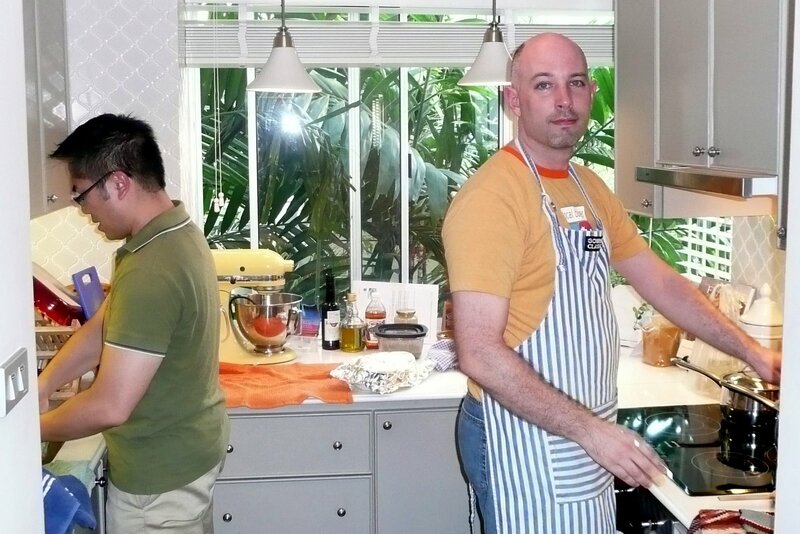 Boon (in green, right) and Kobfa lent extra hands in the kitchen and as other guests arrived, Tawn wasn’t shy about getting their help with last minute arrangements. Tawn’s aunt also came over to keep an eye on things and lend a hand. Since we were downstairs by the pool, we wanted to be able to keep the house open for people to get things and use the toilet. Having someone there ensured that possessions were safe and secure. Also, she helped washing dishes so we didn’t have as much of a mess to clean up at the end of the night. Above, our poolside location. 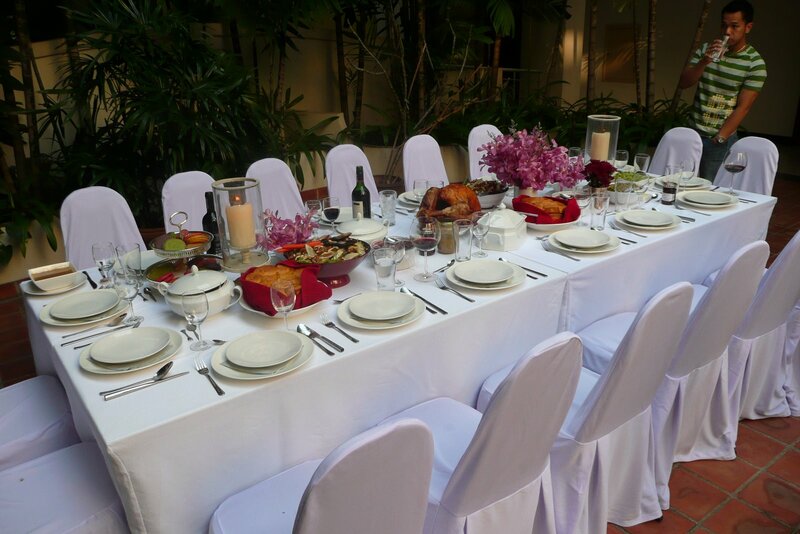 Below, table arrangement by Tawn. Here’s the menu. Links go to the recipes. The pumpkin pie was made by Matt’s partner Si. Unfortunately, I didn’t get a picture of either his pies or the pecan pies I made. They were tasty, though, so if you want his recipe I can track it down. We had time for a group photo before we tucked in. 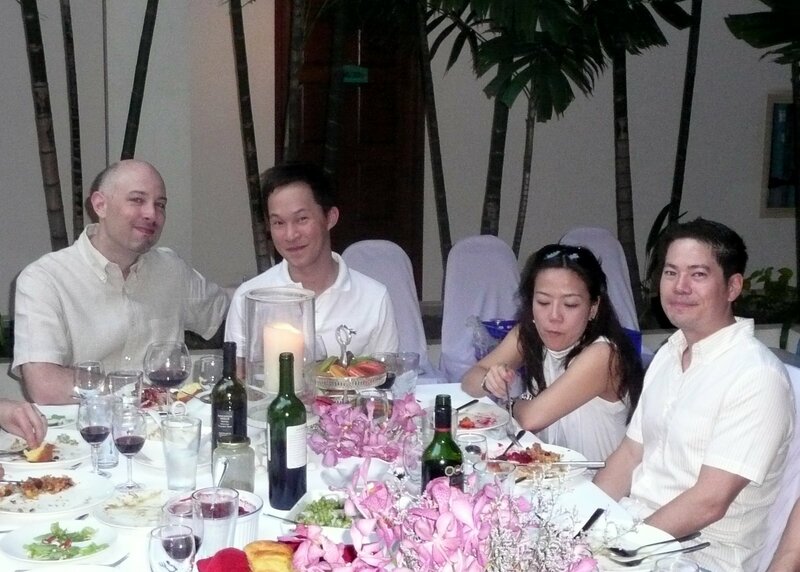 Standing from left to right: Chairat, Francois, Doug, Matt, Markus, Suchai. Seated from left to right: Chris, Tawn, Boon, Kitty, Si, Tam, Kobfa. David arrived a bit later. While guests started serving themselves, Markus assisted me with the turkey carving, a task made all the more difficult by a wobbly table and the wrong type of knife. I guess I should cave in and purchase a carving knife. Below, Kitty and Doug confer, Matt spreads butter on his roll, and Si, Kobfa and Boon converse. Below, the happy hosts with Kitty and Doug. We started dinner about 4:30, which meant that even after a very leisurely meal and visit, we were wrapped up by 9:00. Even after cleaning up and driving Tawn’s aunt home, we were in bed by 11:00. Now that’s quite a feat on a party night! T-Day. For those of you in the United States, Thanksgiving has come and gone, nothing left except your promise to exercise a bit more this weekend and, of course, lots of leftover turkey. Here in Thailand, though, we’re doing a delayed Thanksgiving since everyone has to work on the weekdays. Tawn and I expect about 16 guests over for dinner this evening. This number has changed a lot because of the airport seizures. Brian, Ken and Vic are all stuck outside the country. On the other hand, we have picked up one or two guests as visiting friends of invitees are stranded and cannot get home. Throughout the week, I’ve been doing preparation work for Saturday’s dinner and testing out some new recipes, to decide what should make the final cut. 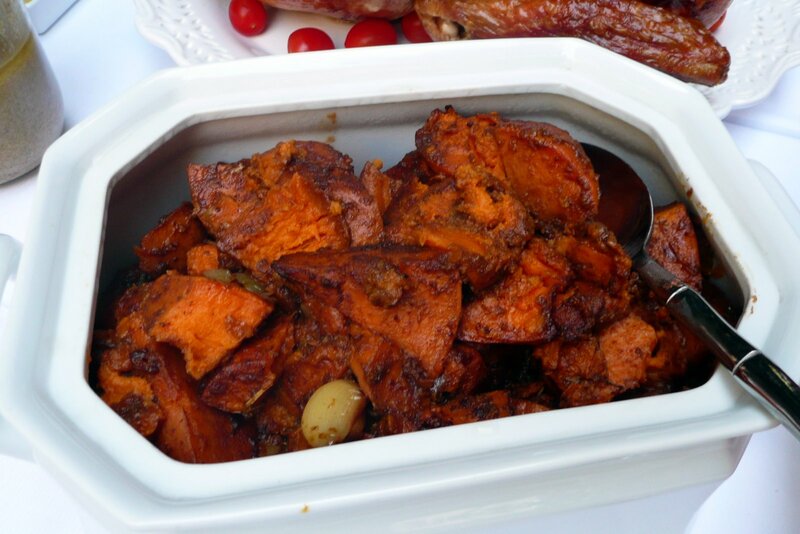 There is a recipe for roasted sweet potatoes with toasted spice rub that sounded interesting. On Tuesday, I made a big batch of the rub and tried it on some regular potatoes. 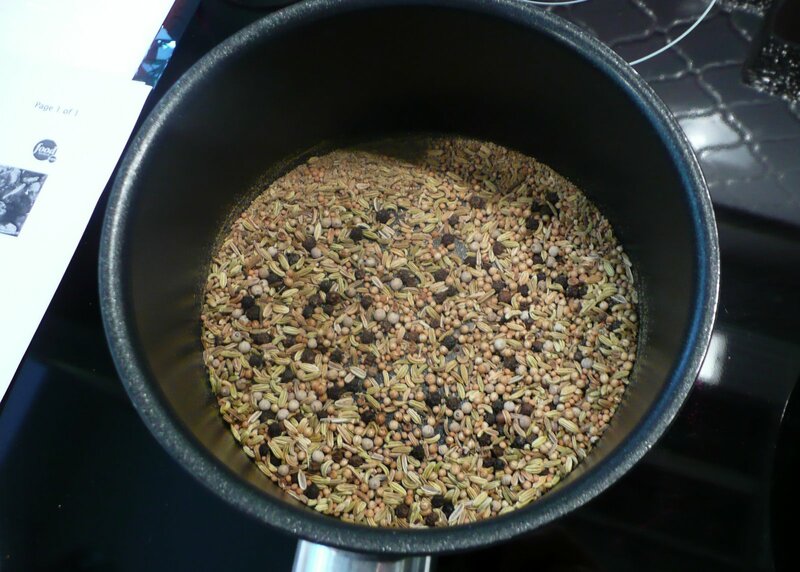 The rub is mostly coriander and fennel seed, with lots of chili powder, crushed chili pepper flakes, and a dash of cinnamon. The flavor was very nice although I think some cumin would add to it. 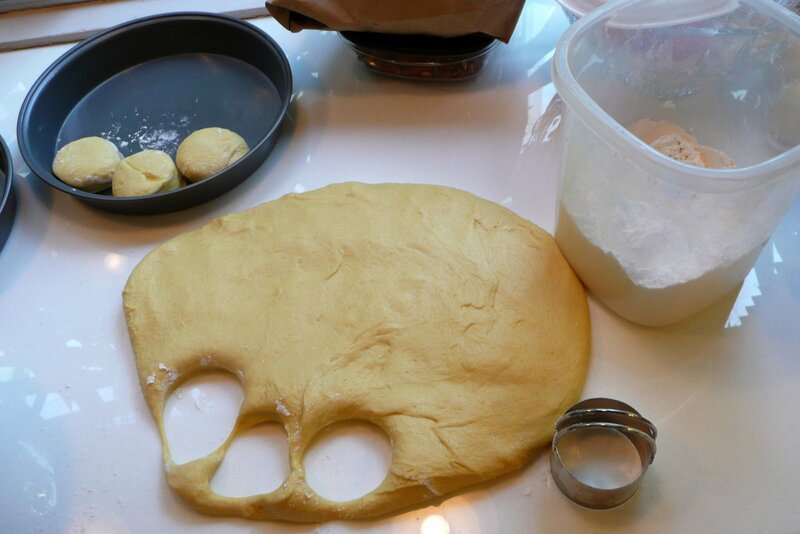 I also tried a recipe from my childhood: Baintree Squash Rolls. 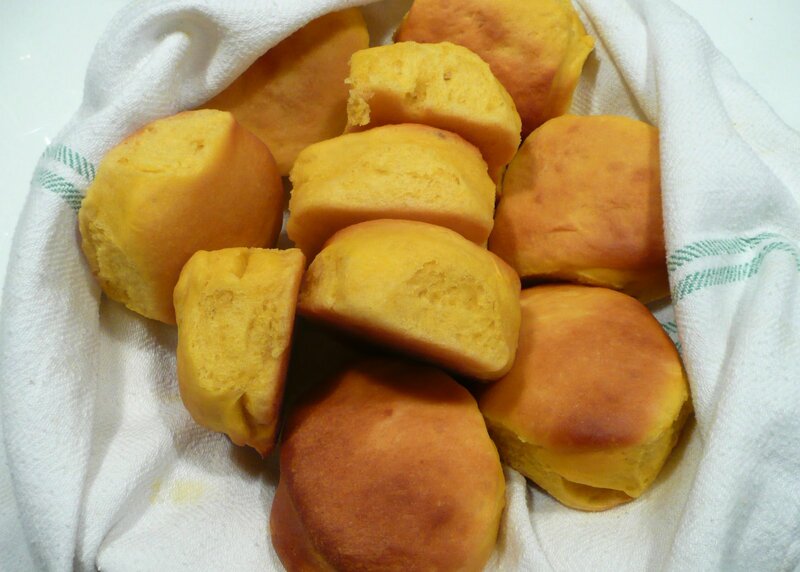 These yeast dinner rolls have roasted squash puree which adds a wonderful color and an addictive flavor. 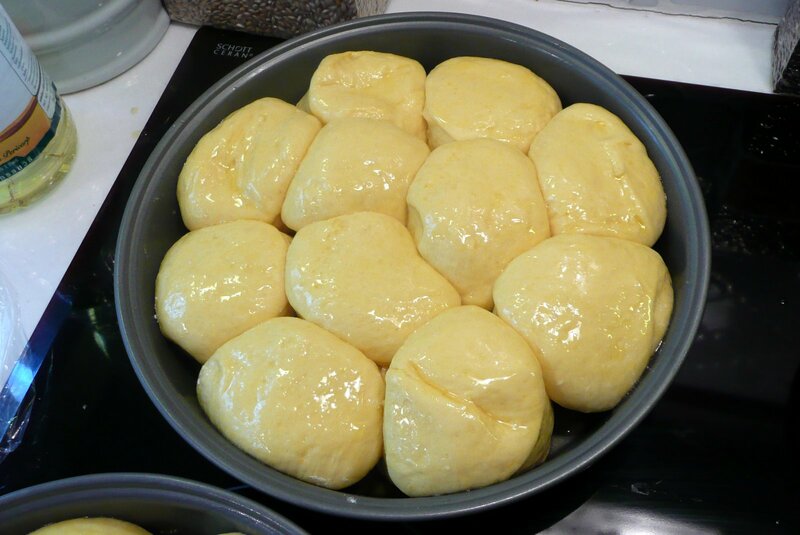 They are easy to make, especially in this warm country where yeast doughs rise without difficulty. There really aren’t that many dishes from my childhood memory. 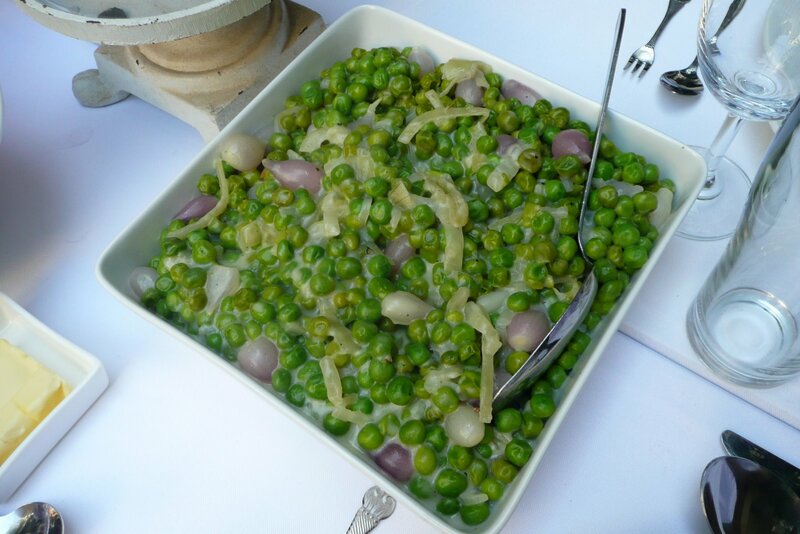 While my mother cooked all the time, I don’t have a firm memory of that many of the dishes. West African Peanut Butter Soup is one. These squash rolls are another. Over Christmas I’ll have to talk with my sister and see what dishes she remembers. Maybe my memory just needs a poke and it will kick back in. Our trial run dinner on Tuesday. This was just for me and Tawn and it tried out a cranberry sauce, the squash rolls, and the toasted spice rub on both regular potatoes and a pork steak. The sauce, as you can see, was very watery. While making it, I kept thinking that there really was way too much liquid and I even ladled some out. 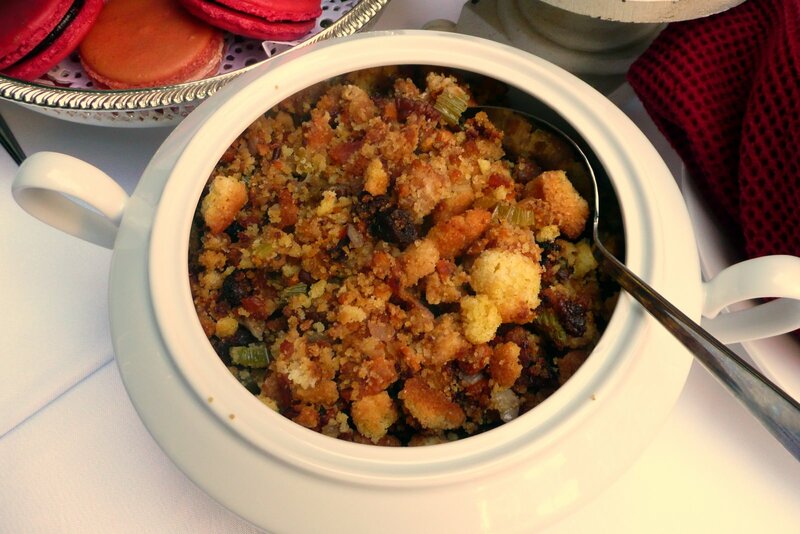 It wasn’t until the following day, reviewing the recipe, that I realized it was watery because I had added only one package of cranberries instead of the three that was called for! The flavor was pretty good, although ratios were off because there weren’t enough cranberries. My final midweek test was with pecan pies. Matt’s partner Si is baking fresh pumpkin pie for Saturday, which is just wonderful. 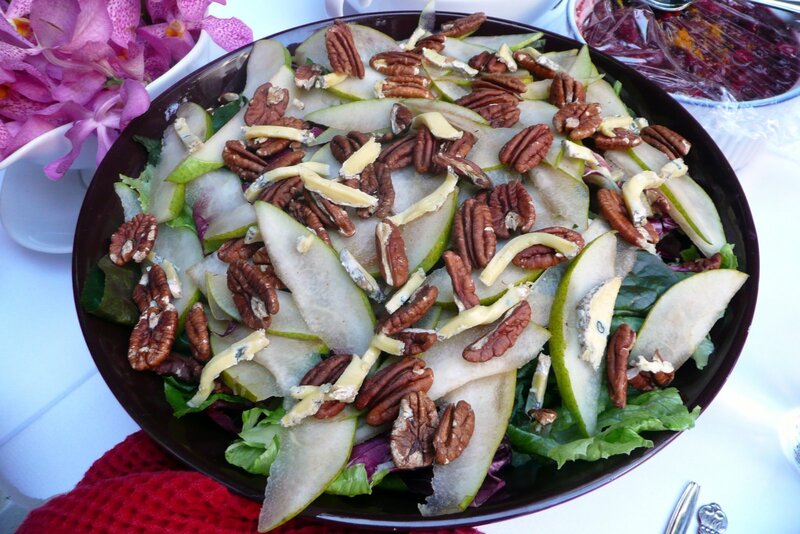 I’m usually hesitant to let guests cook for my parties because most people just go to the store and buy something prepared. This, in my narrow definition of the word, isn’t “cooking”. But I have full faith that Matt and Si will show up with some wonderful desserts. 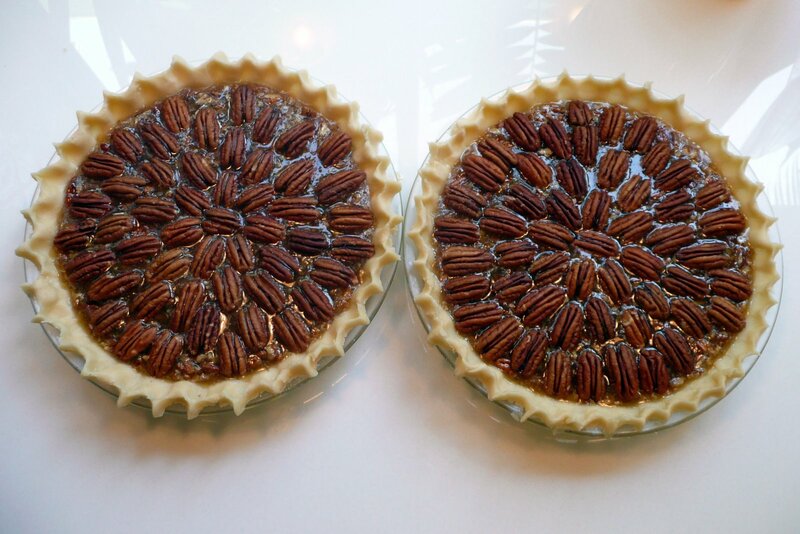 To provide some contrast and an alternative for anyone who doesn’t care for pumpkin (I didn’t as a child, but love it now), I started to think about pecan pie. I have two large bags of pecans from Costco that I trucked back from the US with me last visit. Need to use them up before the next visit so I can buy some more. 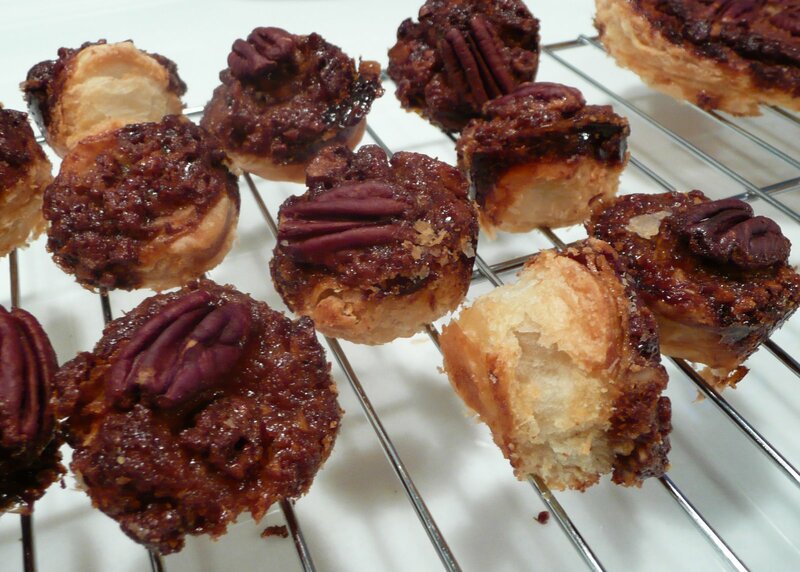 Pecan “tartlets” after being pried from the muffin tin. Never having made a pecan pie before, I actually went out an purchased corn syrup, supporting the agricultural monoculture that is American farming. 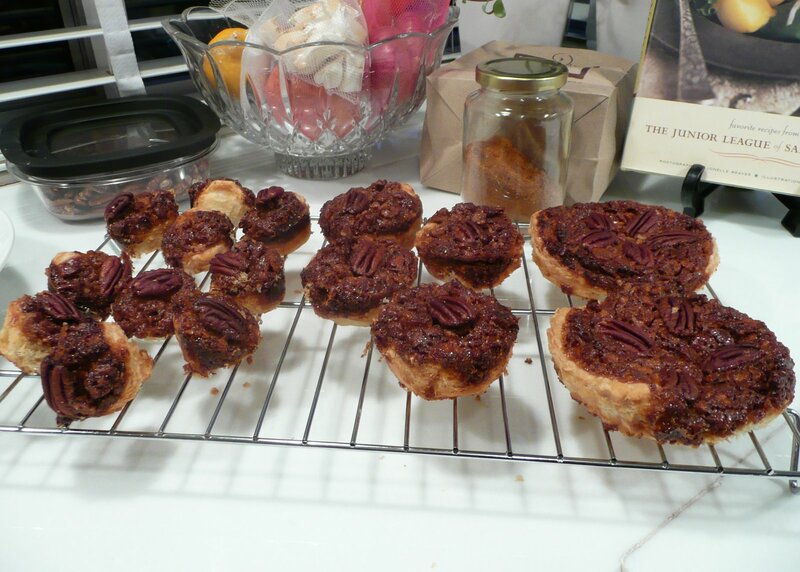 I thought that mini pecan tarts would be fun so I made three different sizes: small, medium and large, below. They tasted fine but the topping just bubbled over the small and medium tarts and made for a huge, sticky mess. It took a long time to get the pans scrubbed clean. Test runs finished and my menu finalized, I started my preparations on Thursday. 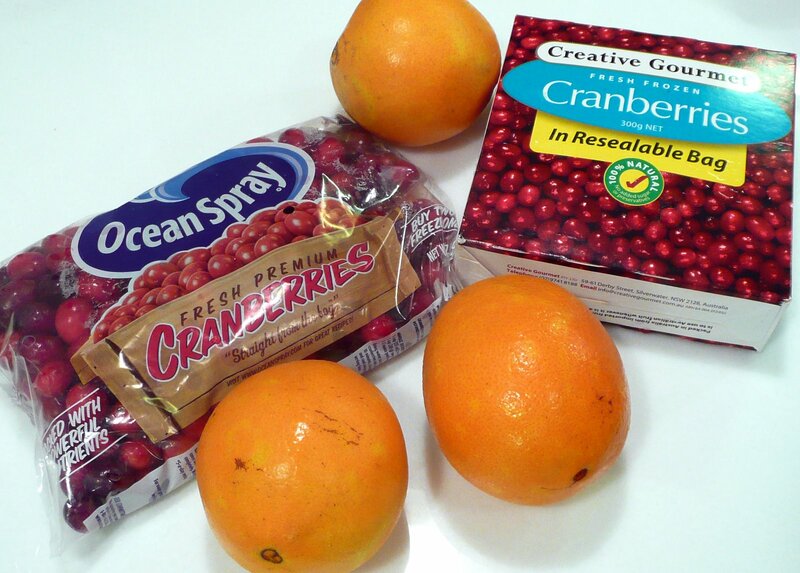 Cranberry sauce was first, a re-do that would this time more closely follow the instructions. Villa Market now had fresh cranberries on its shelves, which had been missing over the past few weeks as I prepared my menu. Curious as to the difference between the two, I bought both fresh and frozen berries. The price (about US$7 for a 12 oz / 300 g container) was the same and I couldn’t tell any difference in taste, texture or quality. 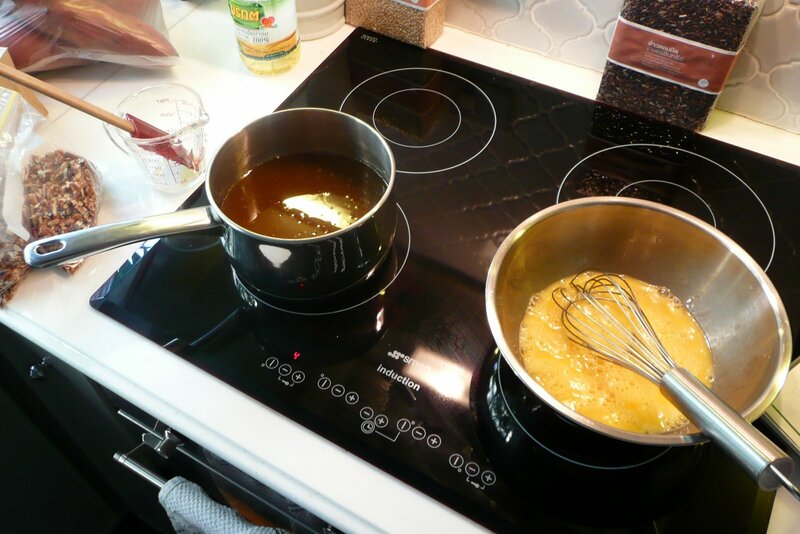 The recipe starts with a simple syrup infused with vanilla, fresh squeezed orange juice is added along with the berries, salt and pepper. This is simmered until the berries start to pop then is taken off the heat. 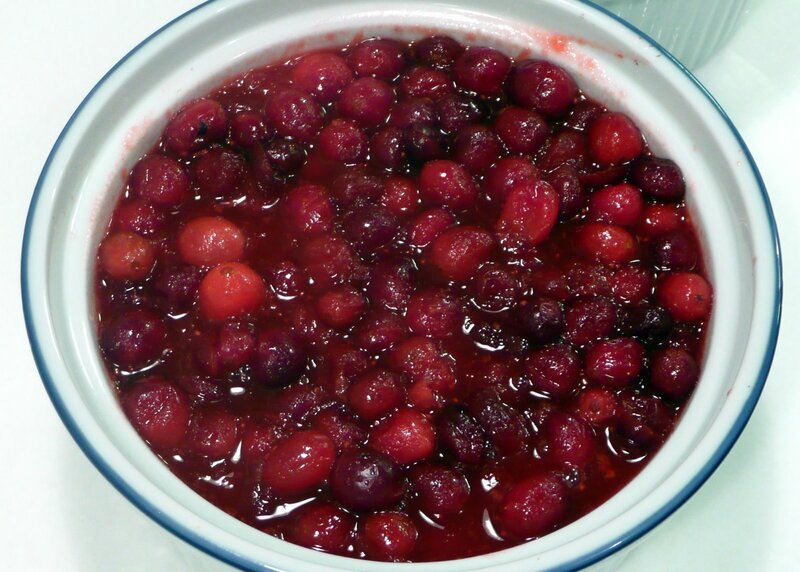 I don’t cook it for too long because I like my cranberry sauce to still have some recognizable berries in it. After taking it off the heat, I stirred in a little Dijon mustard. Sounds strange, right? 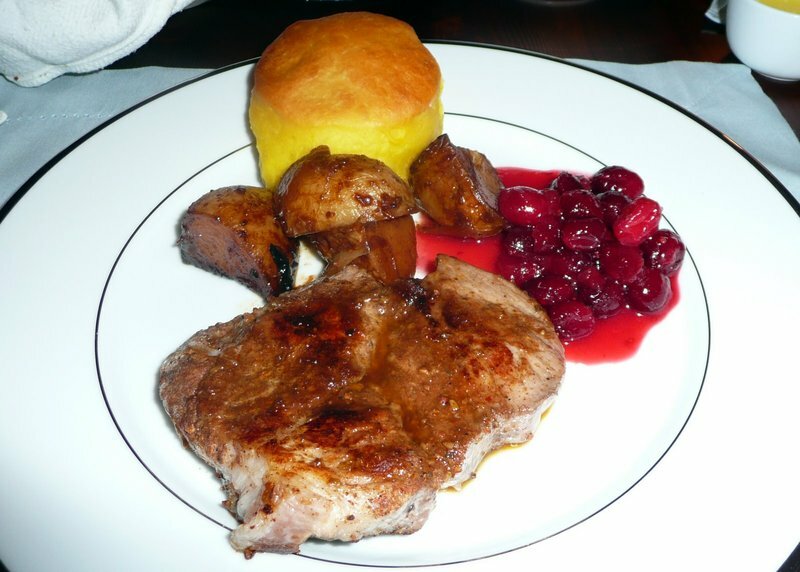 The tangy flavor goes very well with the tart berries and the citrus-vanilla sweetness of the sauce. Friday was final prep. After a day of working and completing some errands (our car battery died this week so we had to get a jump start from a taxi and go buy a new battery), Tawn and I stopped by the market for one final push. 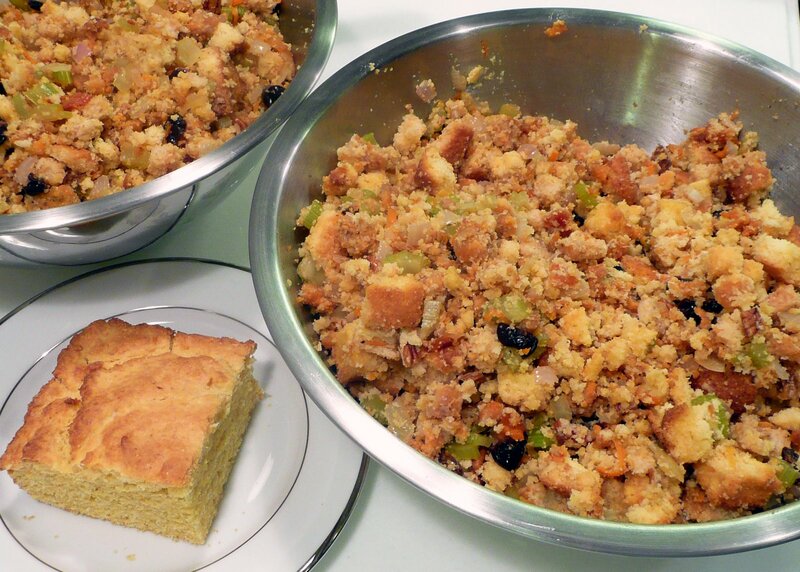 The big item: homemade cornbread chorizo sausage stuffing. This is not a difficult process but it is time-consuming. 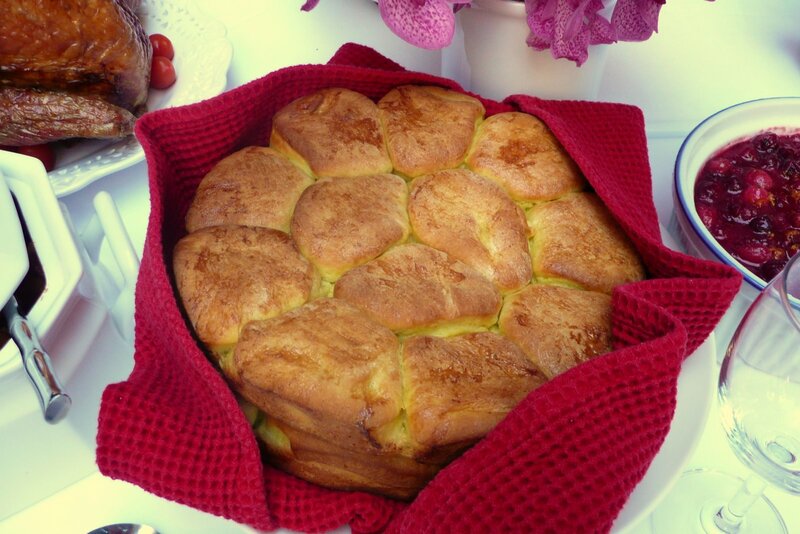 First I have to make the cornbread, then I have to toast the cubed cornbread. I have to cook the sausage and de-fat it. Chop the veggies and cook them, then start combining everything. The nice thing is that this can be prepared in advance, refrigerated, and then baked on Saturday noon. Trying a few bites after I was done, I have to say that this is probably the tastiest stuffing I’ve ever made. 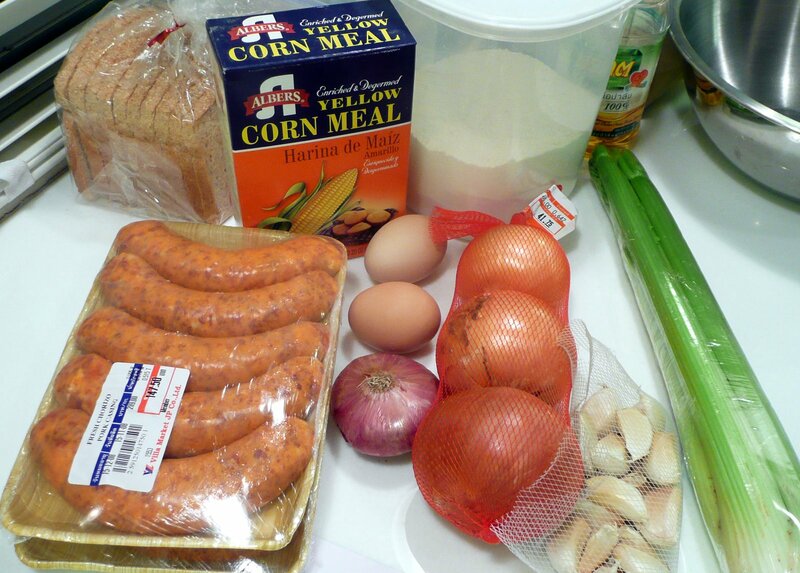 And I was able to find locally made chorizo! After finishing the stuffing, I sifted the ingredients for the rolls and put them in ziploc bags, then made the pie dough and refrigerated it. Finally, before going to bed at 1:00 am, I took the turkey breast out of the bag where it had been dry brining, rinsed it off, patted it dry, and set it back in the refrigerator to finish drying out. 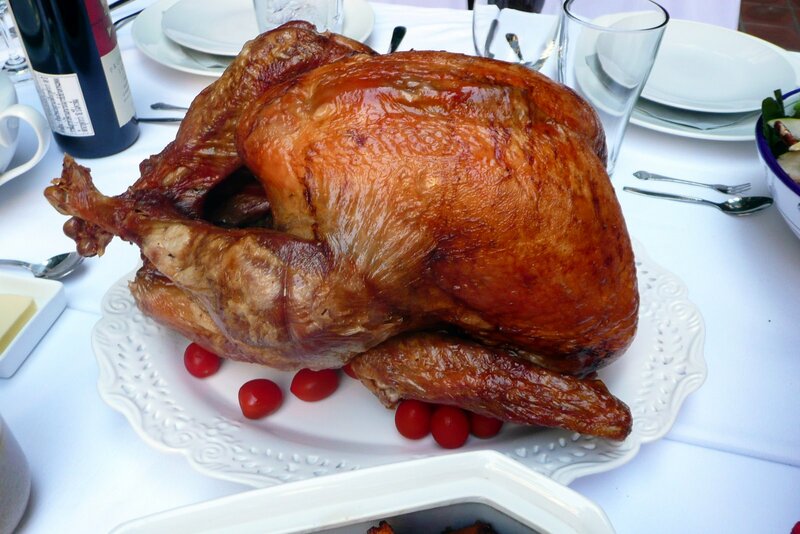 Because my oven isn’t as big as standard US ovens, I’m not cooking the whole turkey – that’s been ordered from Villa and for 1000 baht (about $30) they are baking it for me and making the gravy, too. But I am cooking a turkey breast myself, either so we have a little extra meat or because I feel guilty for not cooking the whole turkey. I’m not sure which it is. So here it is, Saturday morning. Cool – about 74 degrees F – with a light breeze. Our pool-side dinner will be fantastic. I just have a lot of cooking to do. As of this point, I need to finish the pies, make the rolls, roast the turkey breast, bake the stuffing, bake the sweet potatoes, make the salad dressing and go buy salad greens. There wasn’t enough room in the refrigerator for 16 people worth of salad greens. This time tomorrow, I’ll tell you how it went. Following my very topical entry about Thai politics with something completely mundane, here are some shots I’ve taken the past few days. Christmas is coming. Even though we’re a 95% Buddhist country, Thais never pass up an opportunity to decorate and celebrate. Especially at a mall. 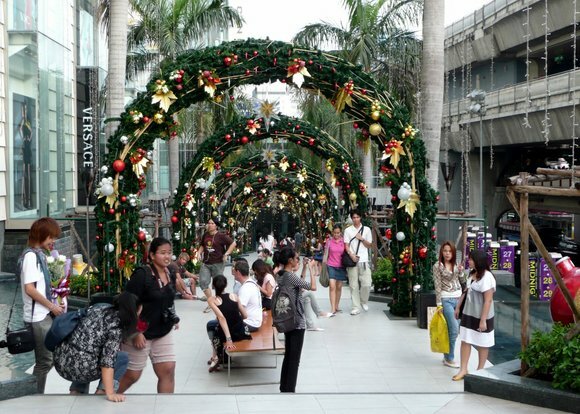 I took this shot at Siam Paragon, one of the larger malls in the center of the city. 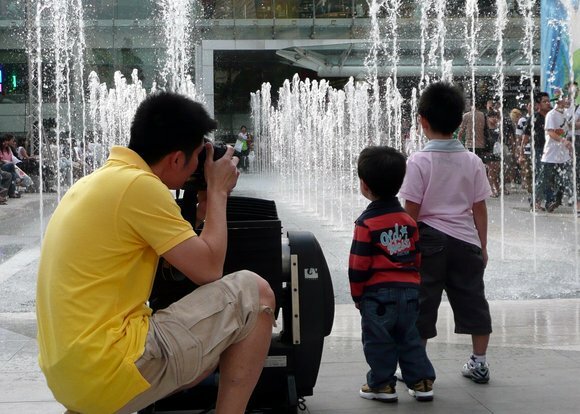 While at the mall, I noticed this father trying to position his two sons for a fun portrait. I also noticed that there were three or four people besides me trying to take a picture of him trying to take his picture. Saturday we did some orchid shopping. Orchids are very inexpensive here so we actually buy live plants and keep them for several weeks (or months, if we’re lucky) until they look sickly. Then we give them to Tawn’s father to nurse back to health. Sunday we had a group lunch at Greyhound Cafe at Soi Ari. This is the first group lunch we’ve had in a while, since everyone was out of town. Slowly, though, they are trickling back. On his flight home, Markus met a pair of Americans – David and Boon – who he decided needed to be introduced to the rest of us. A good choice on Markus’ part as they are friendly people. People who won’t be making their side trip to Laos, I might add. Speaking of which, Stuart brought his friend Rupert who had arrived that morning from San Francisco. On Wednesday I stopped in at Au Bon Pain bakery near our house, only to find the two of them sitting there finishing lunch. Their flight to Burma that morning had been canceled by the protests. 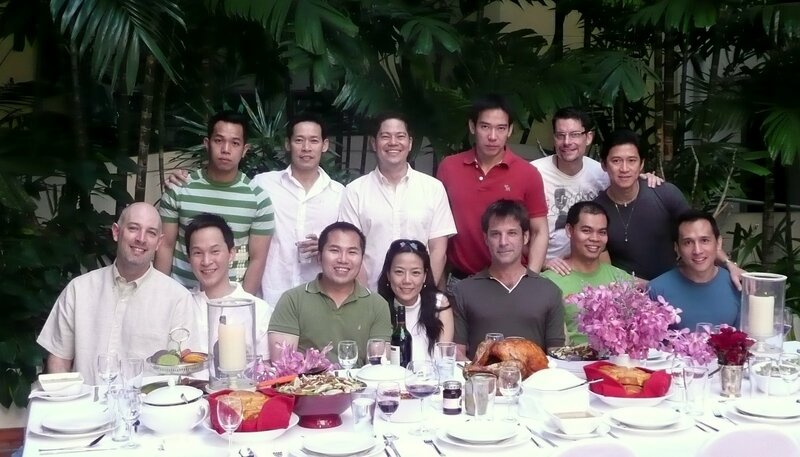 From left: David, Rupert, Markus, Si, Stuart, Matt, Boon, Kobfa, Tawn and me. Another reader of this blog, Rosalie, and her family are supposed to fly from Australia to Khrungthep today. Nix on that. A high school classmate’s partner is supposed to fly here from San Francisco on Sunday. We’ll see if that happens. 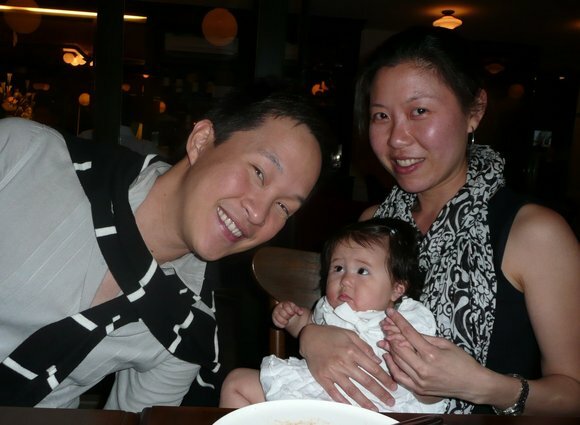 Monday evening we had a get-together for Ee, who is still in town with her infant daughter Vicky. Chris had to return to Melbourne to work, so it was just mother and daughter as we met with several of Tawn’s Chulalongkorn University classmates at a nice new bistro called Minibar Royale on Sukhumvit 23. The food and ambience were nice and I’ll have to go back and try some of the other main courses. Vicky looks horrified as Uncle Tawn leans in for a picture. Aunty Ko is holding her. 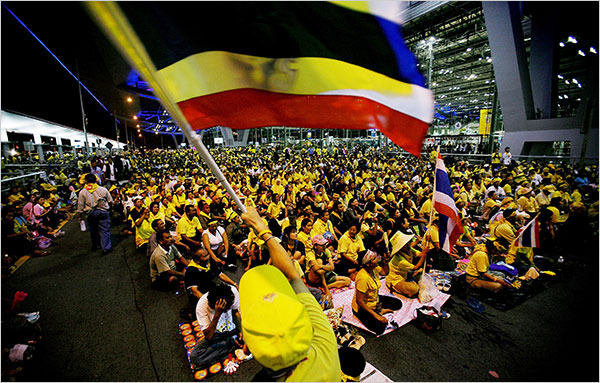 Tuesday evening a group of several thousand protesters – members of the PAD, or People’s Alliance for Democracy – set their sights on a new target: Suvarnabhumi International Airport, Bangkok’s gateway to the world. Already during the week they had shut down the city’s domestic airport and were protesting elsewhere in the city for the Prime Minister to resign and dissolve the government. Right: PAD members at the departures level of the airport. 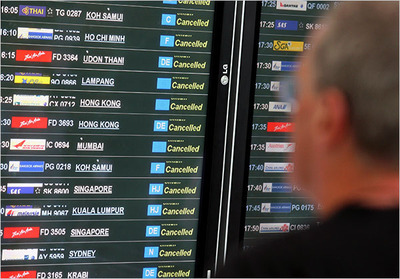 But now we have a truly international mess: thousands of tourists and business people stranded, unable to arrive at or depart from the airport. We have images of protesters acting like thugs and terrorists – a group of six or more protesters surrounded a motorcycle taxi driver, beating him and holding a knife to his throat before letting him go. It is as if in their pursuit of their political goal, they are willing to drag the entire country down. “All this will go away if the Prime Minister just resigns,” the PAD says. Holding an entire country hostage isn’t politics; it’s blackmail. Prediction: a year from now, Thailand’s economy will be even further in the dumps after foreign investors have decided that this was the straw that broke the camel’s back. Tourism will have shriveled another twenty percent or more. 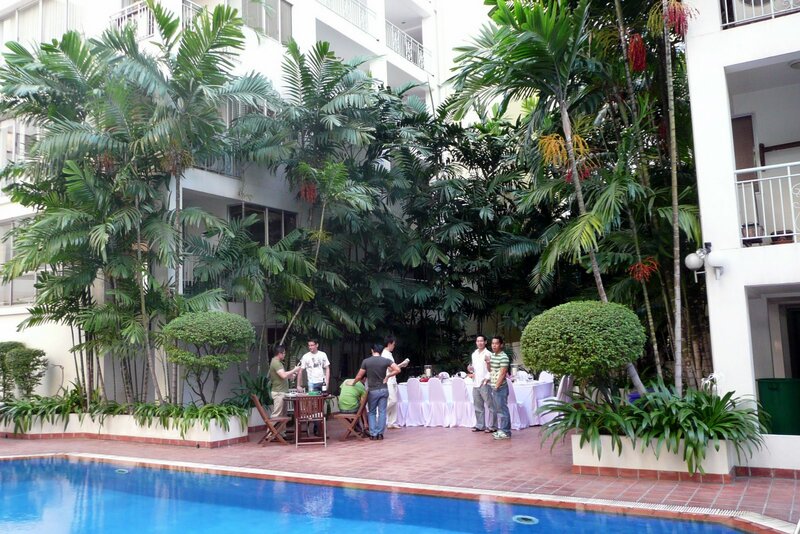 Suddenly Malaysia is looking like a better choice for a tropical holiday. 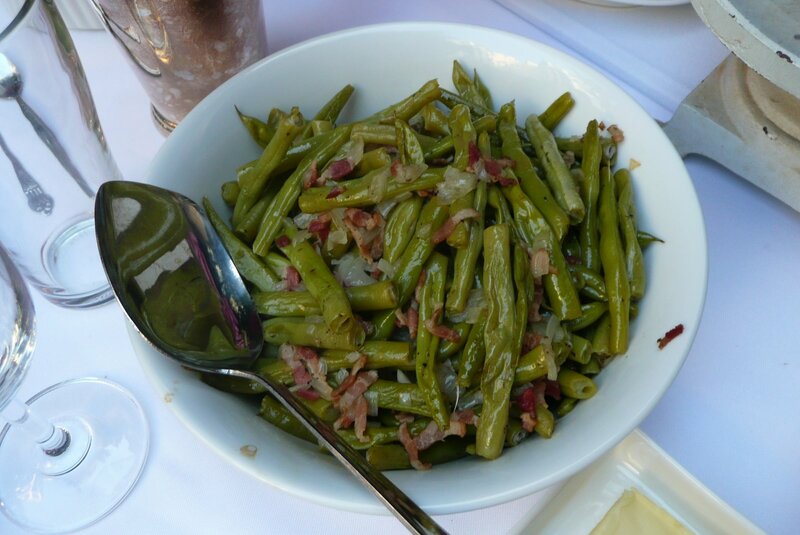 Food for thought: the PAD is largely composed of members of the upper- and middle classes. Groups that are more insulated from the effects of their seige of the airport. Pity the poor member of the working class (who most likely voted for the elected government) and are caught up in this storm, unable to make a living. Photos from the NY Times. Full album here. 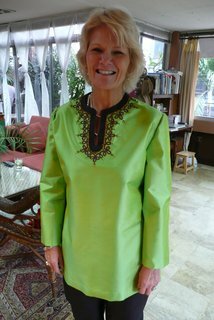 After twelve days in Khrungthep, Trish wrapped up her trip. 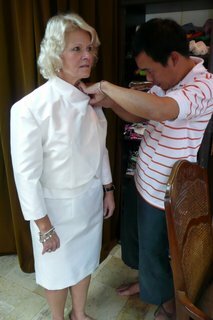 On her last night here, Trish had some unfinished business: a return trip to the Erawan Shrine. A Brahman shrine located on the property of the Hyatt Erawan Hotel, the Erawan Shrine is a popular destination for visitors and Thais alike. The shrine’s reputation is for granting wishes. You come and make offerings and say prayers to each of the four faces of the statue of Brahma. As part of making a wish, you must state what price you are willing to pay if the wish comes true. Traditionally, wishers will make some sacrifice or suffer a hardship. For example, before Tawn took his university entrance exams (in which he had to select which schools he would apply to), he promised that if his wish came true, he would walk all the way home from the shrine (a distance of about ten kilometers). The most common price to pay is to return to the shrine and hire a troupe of classical Thai dancers to perform for Brahma. On her first visit two years ago, Trish gave offerings to Brahma and made a wish. Since her wish came true, she returned to the shrine and hired the dancers. When faced with the dilemma of how many dancers to hire – four, six or eight – she went for the full troupe. Joining us was Biing, who was also on his final night in Khrungthep. As coincidence would have it, both Biing and Trish were scheduled on the same flight to Taipei, although Biing was staying in Taipei for a few days as Trish continued back to the US. 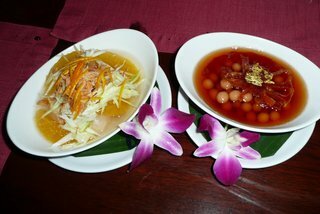 Tawn was under the weather and couldn’t join us, but we had a nice dinner at the Jim Thompson Cafe located off Sathorn Road. 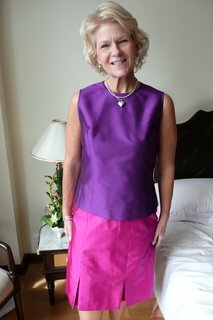 This is the same “Jim Thompson” as the silk company, which provided a fitting end to Trish’s trip as she spent a lot of time at the Jim Thompson shops looking at and purchasing silk. 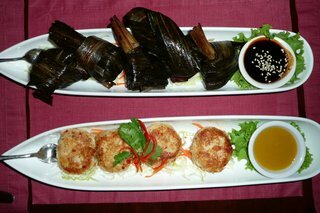 From the upper left, clockwise: Appetizers – chicken wrapped in fragrant pandan leaves, crab cakes with mango sauce; roasted duck in red curry, deep-fried shredded catfish with lemongrass and green mango, stir-fried beef with black pepper sauce, and Northern pork and chili dip with vegetables; Desserts – rice dumplings with candied fruit, lychee and orange with shredded green mango; Homemade coconut ice cream. 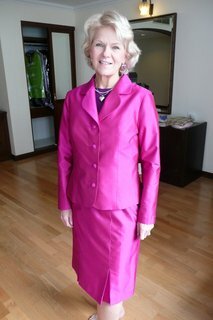 Friday morning before driving Trish and Biing to the airport, Trish modeled some of her finished clothes. Unfortunately, we didn’t have time to shoot all of them, so she has promised to send me copies when she does her complete shoot in a month or so. 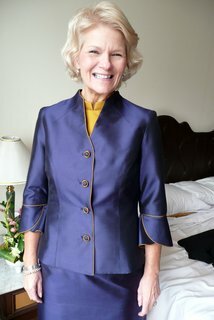 Many people expressed interest in more information about Trish’s company. As things get up and running, I will share those details with you. So what’s next? No sooner has one guest left than more arrive! Sunday we had lunch with some of the usual suspects plus a trio of visitors from the US, friends of Markus and Stuart. We had a wedding on Friday night (more about that later), a get together with one of Tawn’s university classmates who is in town from Australia, and I’m busy getting ready for Thanksgiving dinner, which we’ll hold next Saturday. After our return from Buriram province, Trish had a fitting at the dressmakers’ shops. I met up with her at the second shop, Ratchata. Here are some pictures – you can click on them to see a larger version. All in all, Trish was pleased with their progress. 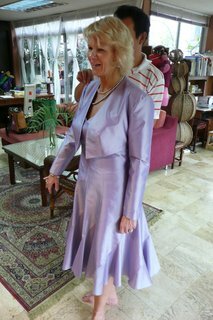 There were a few minor snafus – “Wasn’t this zipper supposed to go in the back?” – but all in all, she’s on track to pick up the dresses at the end of the week. Afterwards, we took a trip to the Anantana Samakhom Throne Hall to see Treasures of the Kingdom V, an exhibit of extraordinary craftsmanship displaying various treasures created in honor of significant occasions such as the Queen’s 6th cycle (i.e. 72) birthday, the King’s 60th anniversary as monarch, and the King’s 80th birthday which was celebrated almost one year ago. These works of art were absolutely amazing, stunningly detailed and gilded beyond belief. Unfortunately, no pictures were allowed. 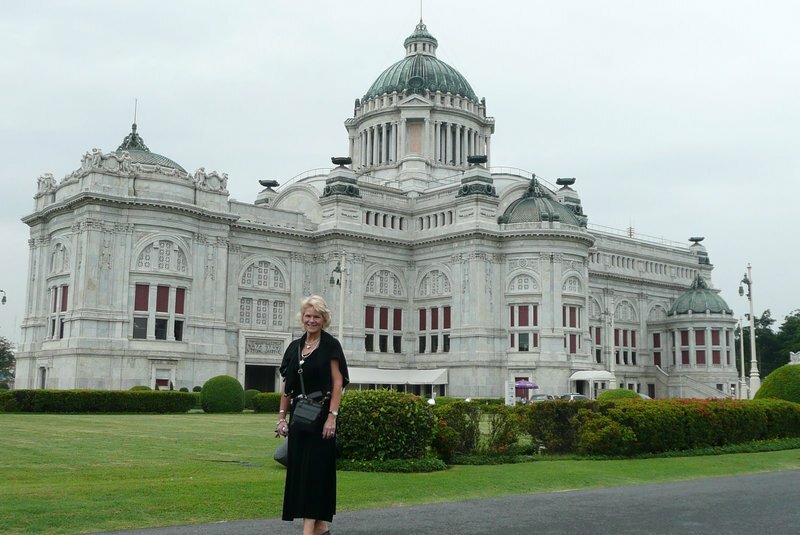 Above, Trish poses in front of the throne hall, in which the exhibit is housed. Twelve days with Trish come to an end Friday but there are a few more entries to share. Stay tuned.